Large house "El Verger", 2 storeys. 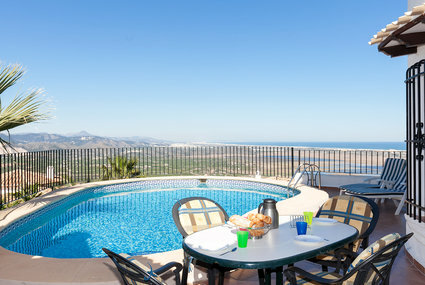 In the district of Monte Pego, in a quiet, elevated position on a slope, 8 km from the sea. Private: orchard, swimming pool angular (8 x 4 m, 01.01.-31.12.) with internal staircase. Outdoor shower, roofed, parking on the premises. Shop 6 km, supermarket 6 km, shopping centre 12 km, restaurant 1 km, bar 1 km, sandy beach 8 km. Golf course 12 km, tennis 1 km. Beautiful, comfortable house "del Azahar". 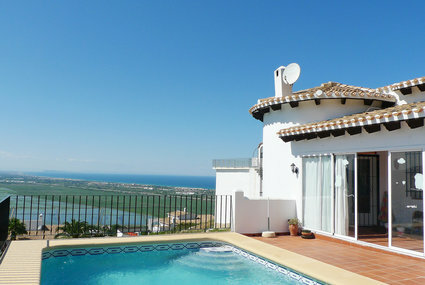 In the district of Monte Pego, in a quiet, sunny, elevated position, 8 km from the sea. Private: terraced garden, 800 m2, swimming pool kidney shaped (4 x 8 m, depth 90 - 160 cm, 01.01.-31.12.). Shop 5 km, supermarket 5 km, shopping centre 12 km, restaurant 300 m, sandy beach 8 km. Golf course (18 hole) 12 km, tennis 500 m.
Cosy house "Giddings", 2 storeys. In the district of Monte Pego, 8 km from the sea. Private: property 1'000 m2, terraced garden wildlife garden, natural garden, swimming pool kidney shaped (4 x 8 m, 01.01.-31.12.). Footpath (25 steps) to the house. Parking. Shop 5 km, supermarket 5 km, restaurant, bar 300 m, sandy beach 8 km. 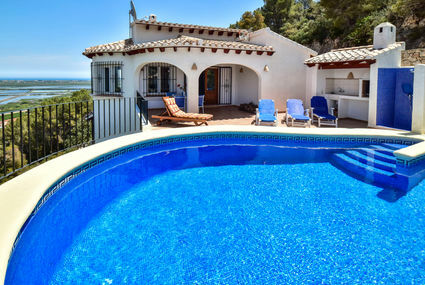 Tennis 300 m.
Monte Pego: Beautiful, comfortable house "Villa Renée". In the district of Monte Pego, 8 km from the sea. Private: property 500 m2, terraced garden, courtyard, swimming pool angular (4 x 8 m, 01.01.-31.12.). Barbecue, parking (for 2 cars) at the house. Shop 6 km, supermarket 6 km, restaurant, bar, café 200 m, sandy beach 8 km. Golf course 12 km, tennis 4 km. Large, beautiful, cosy house "Sueño". 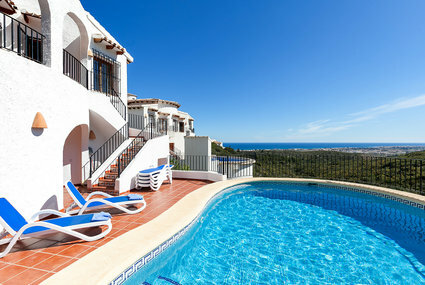 In the district of Monte Pego, in a quiet, sunny position, 6 km from the sea. Private: property with flowers and trees, natural garden, swimming pool angular (10 x 4 m, depth 180 cm, 01.01.-31.12.). Outdoor shower, pool house with cooking stove, arbour, terrace, garden furniture, barbecue. In the house: washing machine. Parking on the premises, single garage. Shop 5 km, supermarket 5 km, restaurant 1 km, bar 1 km, sandy beach 8 km. Golf course 10 km, tennis 3 km. Please note: car recommended. Beautiful, very comfortable villa "Stella". In the district of MONTEPEGO, in a quiet, sunny, elevated position, 8 km from the sea. Private: large, beautiful terraced garden (fenced) with wildlife garden and trees, swimming pool kidney shaped (4 x 7 m, 01.01.-31.12.). Outdoor shower, parking (for 2 cars). Supermarket 5 km, shopping centre 5 km. Please note: car recommended. 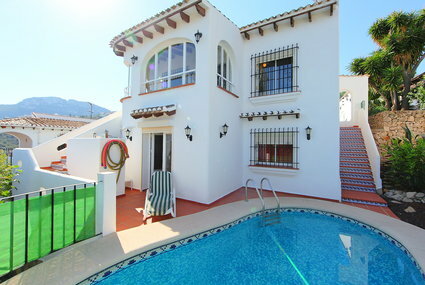 Beautiful, cosy house "Los Patios", 2 storeys. In the district of Monte Pego, 8 km from the sea. Private: property, swimming pool kidney shaped (3 x 6 m, 01.01.-31.12.). Outdoor shower. Motor access (mountain road). Roofed, parking. Shop 5 km, supermarket 5 km, restaurant, bar 300 m, sandy beach 8 km. 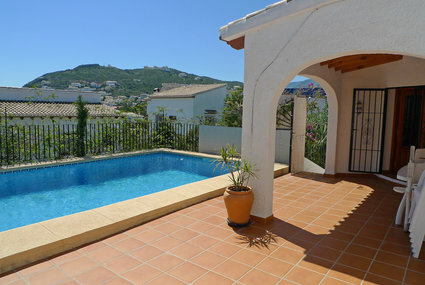 Tennis 300 m.
Monte Pego: Very beautiful, cosy, comfortable villa "Maxey", 2 storeys. In a quiet, sunny position on a slope, residential area (villas), area with little traffic, 7 km from the sea, 7 km from the beach, in the countryside, south facing position. Private: property, large terraced garden wildlife garden, swimming pool kidney shaped (4 x 8 m, depth 80 - 210 cm, 01.01.-31.12.). Room cleaning on request. Parking (for 3 cars). Please note: car recommended. Suitable for families. Very very comfortable villa "Casa Dos Palos". 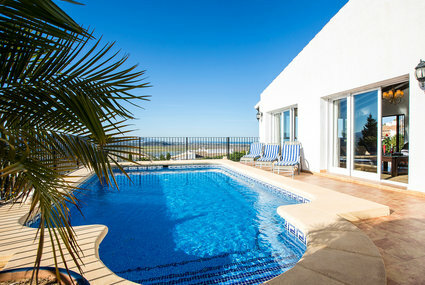 In the district of Monte Pego, in a quiet, sunny position, 10 km from the sea, 10 km from the beach. Private: swimming pool angular (01.01.-31.12.). Outdoor shower, garden furniture, barbecue house, parking on the premises. Supermarket 6 km, shopping centre 13 km, restaurant 4 km, bar 4 km, sandy beach 10 km. Golf course (18 hole) 10 km, surf school 12 km, sailing school 10 km. 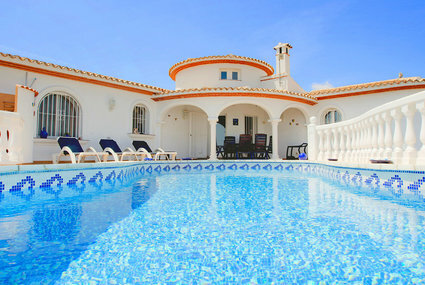 Beautiful villa "Puesta del Sol", 2 storeys, built in 2005. In the district of L'Almunia, in a sunny, elevated position, 10 km from the sea. Private: garden 1'100 m2 with wildlife garden and flowers, swimming pool (5 x 10 m, 01.01.-31.12.) with internal staircase. Outdoor shower. In the house: central heating system, burglar alarm system. Shop 8 km, supermarket 6 km, shopping centre 15 km, restaurant 1 km, sandy beach 10 km. Golf course 20 km, tennis 5 km. Very beautiful, comfortable house "Isabel". 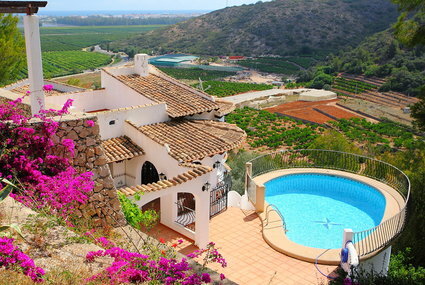 In the district of Monte Pego, 6 km from the centre of Pego, in a quiet, sunny position, 8 km from the sea. Private: garden (fenced) with 1'000 m2, wildlife garden and flowers, swimming pool angular (4 x 8 m, 01.01.-31.12.) with internal staircase. Pool house with fridge, shower and WC, barbecue house, parking on the premises. Shop 6 km, supermarket 6 km, shopping centre 12 km, restaurant, bar, café 600 m, sandy beach 8 km. Golf course (18 hole) 12 km. Nearby attractions: Parc Natural Marjal 5 km. Comfortable villa "Ma-Nita". In the district of Monte Pego, in a quiet, sunny, elevated position in the residential district, 8 km from the sea, in a cul-de-sac. Private: property 1'300 m2 (fenced) with flowers and trees, swimming pool kidney shaped (4 x 8 m, 01.01.-31.12.) with internal staircase. Outdoor shower. In the house: central heating system. Shop 5 km, supermarket 5 km, shopping centre 12 km, restaurant, bar 500 m, sandy beach 8 km. Golf course 12 km, tennis 500 m.